This year, I’m so thankful to spend the day with my husband and our younger daughter. Perhaps we’ll see a few friends and extended family, too. But I admit… I’m a little sentimental, too. My father passed away just last month. My sweet mother-in-law passed last year, two days before Thanksgiving. Our older daughter will be with us at Christmas, but for the first time, not this Thanksgiving due to her military duties. We hang on to traditions, following the same rituals and meals year after year because doing so steadies our lives, gives us something secure to look forward to, hang on to, and remember–future, present, past. But the truth is, every year is a little different, even as we pull out the same recipe books. 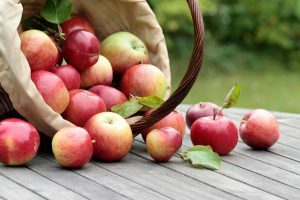 Here is a column that I wrote several years ago–about cider, but also about how we must focus on and savor each moment. If you’re taking a break from your Thanksgiving duties and festivities, I hope you enjoy this piece–but even more, I hope you have lovely moment after moment on this special day. I stare at the last of this season’s apple cider, which I have poured into a wine glass. I’ve chosen such a fancy glass for what most view as a modest beverage in honor of the cider itself, knowing that once I’ve imbibed it, I won’t have the chance to enjoy cider for another 10 months or so. I contemplate the deep amber color of the cider. I sniff the crisply tangy yet sweet aroma. Both color and aroma evoke in my mind’s eye the scenery along the drive to the orchard where we always buy cider every fall, the Crossroads Orchard, west of the Miami River, nestled on a country road between Miamisburg and Germantown. I see the trees, turning yellow, orange, red, their colors so brightly beautiful against a sky burnished to a deep blue from a summer’s worth of hot days, that it hurts, just a little, to look at them. Then there’s the drive back. We always pause at the top of the hill to stare down at Miamisburg and the church spire and building tops and tree tops and the river and, sometimes, a freight train chugging along on the tracks by the river. Then we drive down the hill and quickly lose our bird’s eye view. But that’s OK. We’ve just experienced autumn the way we most enjoy it—a pretty little country drive, to a pretty little country orchard, operated by some of the nicest people we’ve ever met. We tell ourselves it’s just the taste of the cider—unlike the thin, homogenized kind you can get at the grocery—that has inspired us to take this trek, Saturday after Saturday, for about 8 or 9 weeks each fall, for the past decade. But secretly we know, it’s just as much about the trek itself. And now I’m contemplating my last glass of the year. I’m reluctant to sip it, because I have some serious questions. Will I savor the cider? Or gulp it a little too quickly, as I have several times this autumn, thoughtlessly forgetting to enjoy a pleasure that flits in and out of our lives as quickly as the leaves turn brilliant and then scatter in the first frost-tinged wind? Or should I invest in a freezer, just for cider? You can freeze it, you know. You just pour a little off the top of the bottle, to give the cider room to expand, and then recap it tightly and pop it in the freezer. It’s not as crazy as it sounds. People have cellars just for wine. Why not a freezer just for cider? In its own way, the beverage is just as sweet an experience as wine. I finally take the first sip of my last glass of this year’s cider, making sure to savor the sweet, crisp, tart flavor before swallowing. 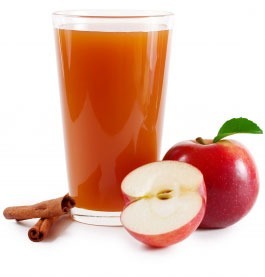 And the answer to my cider-freezer question is in the taste and aroma and even the amber color of the cider itself. If I could have cider any time—say, on New Year’s Eve, or in the midst of February, or poolside, July 4—then it wouldn’t be a treat. It would become just another commodity in a Big Gulp world. I’d forget the lessons that cider teaches me for several quick weeks every fall. To feel gratitude for those who craft things like cider. To pause and enjoy the views.